I’m an artsy person. I love anything related to art, or music, so you’d think that I would be the first one having my kids read and write about every artist in the history of Spanish art. 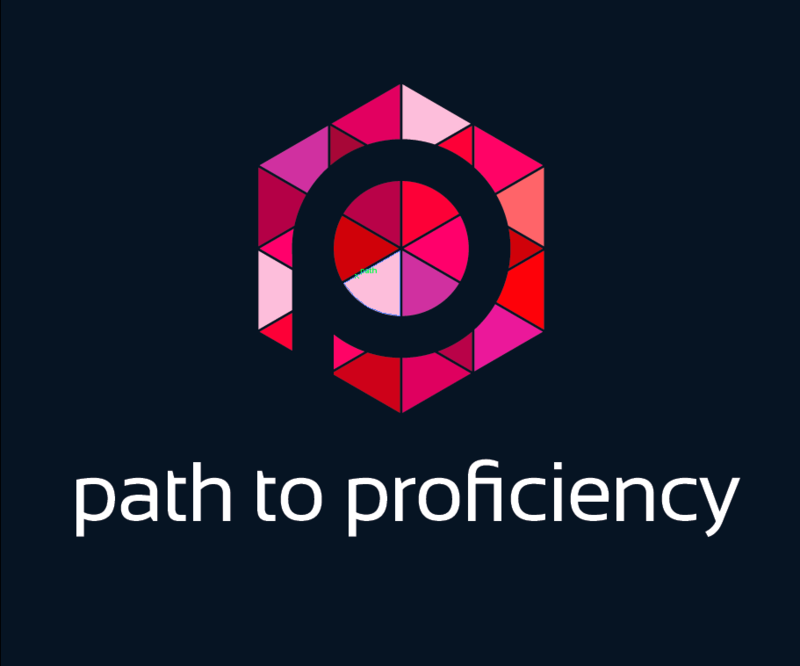 The reality is, however, I teach Novice-Intermediate learners how to use the Spanish language. Don’t get me wrong, I love that. I LOVE that I am the content area where we can color because I can make it an appropriately leveled interpretive reading task. Some days, though, I feel like I just teach colors and numbers to 17 year-olds (32 kids at a time). 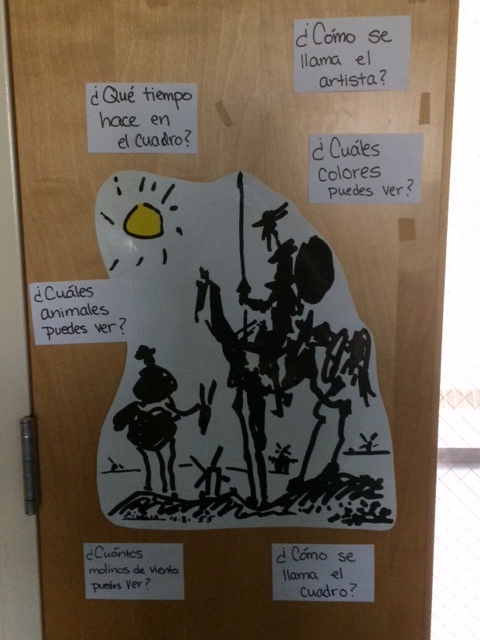 Since I do not teach AP Spanish Lit, and because I refuse to do a lesson in English to teach them about something cool and cultural, my opportunities to incorporate real culture and art were few and far between. Why I’m writing this though, is that this year I had a breakthrough in my brain about HOW to teach content through culture. I know we’re supposed to do that, but the HOW of it is often not explained as well as we would probably like, right? So, this is what I did, in one small area related to Art, colors and numbers. I hope it helps. It was the beginning of the year and I needed to teach (wait for it) COLORS AND NUMBERS to my Level 1 kids. They don’t necessarily need colors right off the bat, but the easiest way to describe anything for me is with color and size, and it gives you that easy lead in to showing how adjectives work in the language without lecturing on adjective agreement (which is boring and they don’t remember it anyway). 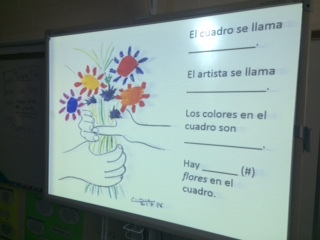 They had a colors sheet with images and Spanish words, and a numbers sheet already, so it wasn’t about teaching the colors or numbers as much as actually using them for something cool. So anyway, a long time ago I had collected a bunch of art posters and had looked online for famous Hispanic artwork and made it into a slideshow for a rainy day. I had no idea how I was going to use it in the target language, which is why it was just taking up space on my flash drive. Cool cultural art, but I don’t want to lecture them on Picasso because that probably wouldn’t fall under “comprehensible input”, so…? Then it hit me…Picasso’s beautiful Hands with Flowers has very clear colors, things we can count (flowers, hands, petals, fingers), and gives me a brief moment to show Picasso to my kids! I made up a story in super simple Spanish (lots of acting out and terrible whiteboard drawing took place at that point) about driving past a park, seeing this sidewalk art show and wanting to buy things, but all I could remember were the images. 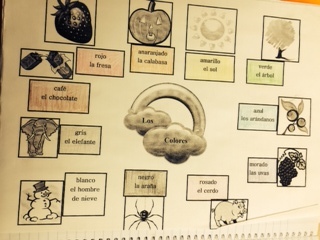 And then I knelt down and said something like “PLEASE HELP ME!” in Spanish, and flipped the slide. 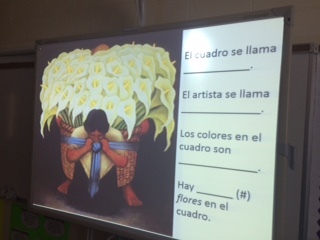 On my redesigned Hispanic Artwork slides were 4 questions in Spanish: Who is the artist? What is the piece called? What colors do you see? How many ____ are there?” Later on I added “Do you like it? Why/Why not?”as a 5th question. At that point, everybody shared everything they figured out, artist, title, and “flores is probably flowers” and the answers to the other things on the slide. The coolest part? They wanted to do another one! Of course, I just happened to have another one…but this time it has even MORE FLORES! Now, this is NOT something you can do as a death march through art history. I did 3 slides that day. I did a few the next time they came in, and waited a few days for the ones after that. The point is, it was fun! They were investigating something they never would have looked at on their own, and we were doing it IN SPANISH!!! I had so much success with that class, that I used the 12 Art Quest slides, printed as 6 to-a-page handouts, as the paired activity another one of my classes worked on while I was doing 1-on-1 Interpersonal Speaking assessments. I don’t have color copying or anything, but they got the general idea and the color obviously showed on their phones when they Googled it. So, after that Art Quest experience, my classroom became a mini art gallery. I have 4 art posters up in my room, currently, and I decided to make them interactive for my other classes who didn’t do the Art Quest. I took 3×5 cards and wrote a bunch of different questions my novice kids could understand, related to the painting, and put them all around the painting. When kids space out in my room, which happens sometimes, they start looking at the posters and can’t help but read the questions. Also, I use them as quick warm ups and brain breaks. 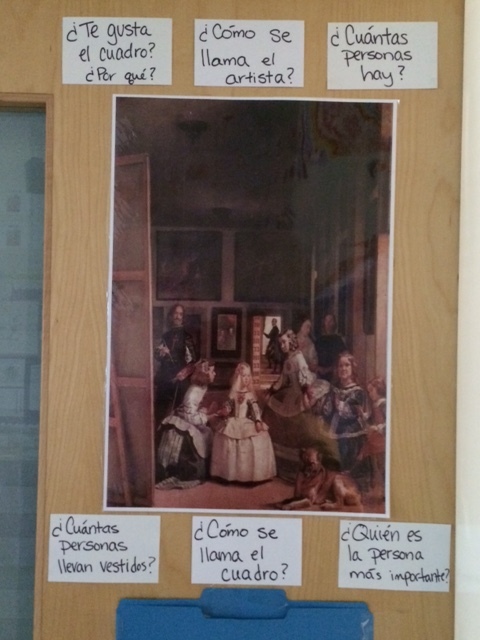 In Spanish, either in writing or spoken, I say, “Take a post it note to a painting and answer 2 questions of your choice.” I don’t do anything but read their answers later. It’s not evaluative. I’m just interested to see what they can do. Side note about Post Its: I use them a lot for exit tickets and reflections, and I always have them write their name on the back. I tell them they have to own their words, so if they’re going to express an opinion (positive or negative), they should be bold enough to have their name on it. If you would like to try it, here are the slides I used for the original Art Quest. I hope you have similar success! Thank you for sharing your experience. You have inspired me to try this.